Angie Dotson, RN BSN, is a community educator at Henry County Medical Center. Her job revolves around teaching people the symptoms and signs of heart attacks, strokes, etc. Dotson, because she walks the walk, knew there was no family history of either. Imagine her surprise in March 2014 when she stopped to gas her vehicle and experienced complete double vision. Dotson had bilateral CVAs (strokes) to the cerebellum, and a third in the mid-brain. Her parents took her to Henry County Medical Center’s emergency room, just two blocks away. After a visit to her eye doctor the next day, Dotson was told she needed an MRI. She was still experiencing double vision, and nausea had set in. Once the MRI was completed, Dr. Mitchell called the ER immediately. “From the moment I walked in, the first question was, ‘Are you opposed to flying?’” Dotson said. Dotson praised Craig Peeveyhouse, now the director of the HCMC ER. 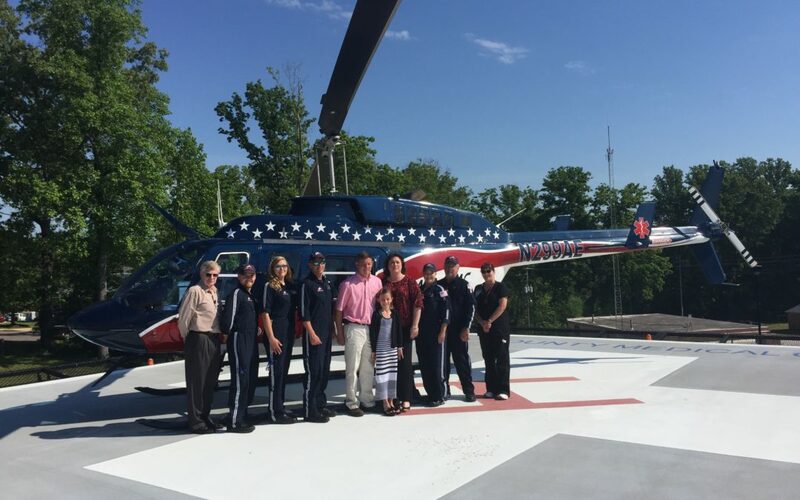 The Waverly, Tenn., Air Evac crew of pilot Keith Roy, flight nurse Karen Ledbetter and flight paramedic Frank Miller flew Dotson to Vanderbilt University Medical Center in Nashville. Dotson remembers how calm she felt on the aircraft. Ledbetter wrote down a cell phone number for Dotson’s husband, Jason, and called him upon arrival at the hospital. “He was still driving, and that was such a comfort to him, knowing I arrived fast and safe,” she said. Ledbetter, now program director for the Waverly Air Evac base, said she always tries to keep the patient’s family informed. Thanks to the combined efforts of doctors at HCMC and Vanderbilt University, and the rapid transport from Air Evac, Dotson is back at work, and celebrated her 40th birthday in December 2014.